PHOENIX – As Arizona joined the rest of the nation in grief and horror over a deadly mass shooting in Las Vegas where at least 59 people were killed and more than 500 wounded, Arizona residents scrambled to see whether loved ones and family who had attended the concert were safe. A University of Arizona college student was missing, her sorority said on social media, and an off-duty officer with the Mesa Police Department who was attending the country-music festival with several other department members was wounded slightly, according to a police statement. One media account said a bullet grazed his face. The police officer is recovering from the near miss, KTAR news reported. An Arizona trooper also suffered multiple shrapnel wounds, a spokesperson with the Arizona Department of Public Safety told the news organization. “My co-worker died and got hit in the head, and I had a guy die on me,” said Justin Uhart, a 2014 Arizona State University graduate who said he was working at the concert as a bartender. “I’m a little shook up still, honestly,” he said in a Facebook interview with Cronkite News on Monday. 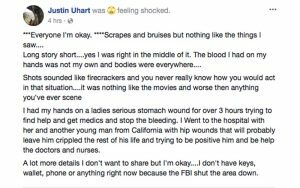 “I know people that died and can’t really get the images out of my head,” said Uhart, who also posted on Facebook. A gunman with a long-ago tie to Arizona rained carnage from the high floor of a Las Vegas hotel Sunday night on about 22,000 people attending the Route 91 Harvest Festival, a three-day outdoor festival. Organizers planning outdoor concerts in Arizona and overseeing sports and entertainment venues rushed to reassure the public they would put safety measures in place. Arizona blood banks added blood drives to help the shooting victims. Santoyo and her family were staying at Ellis Island Casino and Brewery, only a few blocks from the event. They were walking near the Vegas Strip when concert attendees fled the scene. Arizona State University student Kendal Balas was at the concert with her family. She recalled the events in a Facebook post early Monday morning. Balas and her family huddled under the stage alongside other attendees until the gunshots passed. A sheriff later evacuated them and they ran to a nearby hotel, Balas wrote. The gunman, identified as Nevada resident Stephen Paddock, 64, was found dead surrounded by rifles on a high floor of the Mandalay Bay Resort and Casino. His father, Benjamin Hoskins Paddock, was convicted decades ago of robbing banks in Phoenix. An archived report from the Arizona Republic described him as a Tucson resident and three-time bank robber of three Valley Bank branches. Paddock was eventually arrested, but escaped from jail while serving a 20-year sentence. Following his escape, he was added to the FBI’s Ten Most Wanted list. In an FBI wanted poster, Benjamin Paddock was described as “psychopathic,” according to the Washington Post.